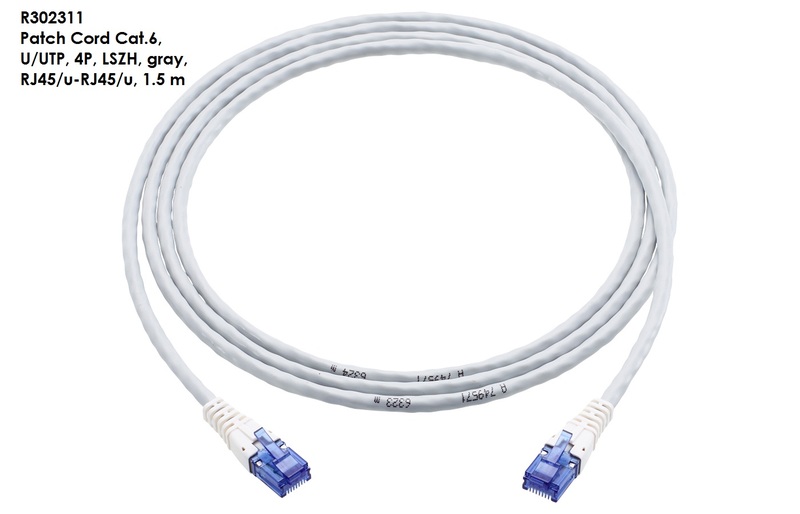 Flexible cable, U/UTP, 4 x 2 x 0.18 (AWG 26), color gray (RAL 7035), mounted on both sides with RJ45 connectors compliant with Cat.6 component standard. Key standard: IEC 60603-7 RJ45 category 6; IEC 60603-7-1 to 5. Complies with requirements of Cat.6 for the establishing of transmission links of class E in acc. with ISO/IEC 11801 ed. 2.2, June 2011 and EN 50173-1, May 2011 (DIN EN 50173-1). Low-smoke in acc. with IEC 61034 and halogen-free in acc. with IEC 60754-1. Halogen-free and heavy-metal free in acc. with EU directives RoHS 2. Can accommodate color coding and mechanical coding "Easy Latch", "Data Safe Lock" and "Safe-Clip". Strain-relief function in acc. with TIA 568-C.
Standardisation : Compliant with Cat.6, Class E (250 MHz) requirements: ISO/IEC 11801 ed. 2.2. Compliant with Cat.6 component standards IEC 60603-7-4 and 60603-7-5. Fulfilled the standard IEC 61935-2:2010.